The glomerular filter of the kidney serves to remove waste from the blood and retain large plasma proteins. The glomerular filter consists of fenestrated endothelial cells, the glomerular basement membrane (GBM), and podocytes, which are specialized epithelial cells that are essential for structure and maintenance of the filtration barrier. It has been proposed that podocytes also remove proteins that cross the GBM when the glomerular filter is compromised; however, it is not clear how this process occurs. Jun-Jae Chung, Tobias B. Huber, Markus Gödel, and colleagues at Washington University School of Medicine used fluid-phase tracers in murine models to evaluate fluid uptake by podocytes. Podocytes actively internalized fluid from the plasma, and the internalization rate was increased in response to glomerular filter barrier damage. Serum albumin-associated free fatty acids (FFAs) induced macropinocytosis in podocytes, a process mediated by FFA receptors, the Gβ/Gγ complex, and RAC1. Animals fed a high fat diet had increased serum levels of FFA and were more susceptible than standard chow-fed mice to drug-induced proteinuria. The results of this study demonstrate that podocytes internalize fluid via macropinocytosis and that albumin-bound FFAs, which cross the damaged glomerular filter, markedly enhance fluid uptake in podocytes, leading to podocyte dysfunction and death. 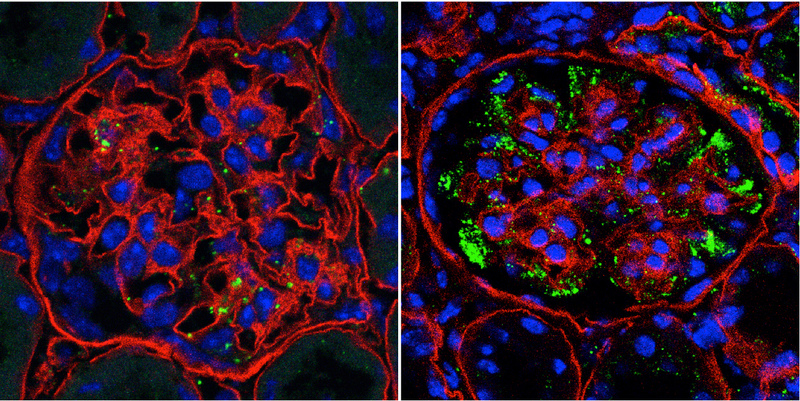 The accompanying images show fluid-phase uptake (FITC-ficoll, green) in the kidneys of WT mice (left) and Lamb2-/- mice (right). Sections were stained for lamin α5 (red) and Hoechst (blue). Citation Information: J Clin Invest. 2015;125(6):2307-2316. https://doi.org/10.1172/JCI79641. Podocytes are specialized epithelial cells in the kidney glomerulus that play important structural and functional roles in maintaining the filtration barrier. Nephrotic syndrome results from a breakdown of the kidney filtration barrier and is associated with proteinuria, hyperlipidemia, and edema. Additionally, podocytes undergo changes in morphology and internalize plasma proteins in response to this disorder. Here, we used fluid-phase tracers in murine models and determined that podocytes actively internalize fluid from the plasma and that the rate of internalization is increased when the filtration barrier is disrupted. In cultured podocytes, the presence of free fatty acids (FFAs) associated with serum albumin stimulated macropinocytosis through a pathway that involves FFA receptors, the Gβ/Gγ complex, and RAC1. Moreover, mice with elevated levels of plasma FFAs as the result of a high-fat diet were more susceptible to Adriamycin-induced proteinuria than were animals on standard chow. Together, these results support a model in which podocytes sense the disruption of the filtration barrier via FFAs bound to albumin and respond by enhancing fluid-phase uptake. The response to FFAs may function in the development of nephrotic syndrome by amplifying the effects of proteinuria.